In the 1960s a new band known as the Beatles burst on the pop music scene and changed it forever. Band members included George Harrison (1943–2001), John Lennon (1940–1980), Paul McCartney (1942–), and Ringo Starr (1940–). With the release of three anthologies (collections) in the mid-1990s, the Beatles remain one of the best-selling musical groups of all time. The Beatles came from Liverpool, England, and were originally inspired by the simple guitar-and-washboard style "skiffle" music. Skiffle was a lively type of acoustic (nonelectric) music that used songs from British and American folk and popular music. Later such U.S. pop artists as Elvis Presley (1935–1977), Buddy Holly (1936–1959), and Little Richard (1932–) influenced them. All four members of the Beatles had an early interest in music. Beatles went through several additional members as well as through several name changes. After the Quarrymen they became Johnny and the Moondogs. Later they called themselves the Silver Beatles, and, eventually, simply The Beatles. They played not only in Liverpool, but also in Scotland and in Hamburg, Germany, in 1960. When the Beatles' bass player, Stu Sutcliffe, decided to leave, McCartney took over that instrument. Upon their return to England, a record shop manager named Brian Epstein approached the band about becoming their manager. Within a year of signing Epstein on as manager, the Beatles gained a recording contract from EMI Records producer George Martin. Drummer Pete Best left the group and a sad-eyed drummer named Richard Starkey, better known as Ringo Starr, joined. Despite initial doubts, George Martin agreed to use Lennon and McCartney originals on both sides of the Beatles' first single. "Love Me Do," released on October 5, 1962, convinced Martin that, with the right material, the Beatles could achieve a number one record. He was proven correct. The Beatles' "Please Please Me," released in Britain on January 12, 1963, was an immediate hit. The Beatles' first British album, recorded in one thirteen-hour session, remained number one on the charts for six months. The United States remained uninterested until, one month before the Beatles' arrival, EMI's U.S. company, Capitol Records, launched an unprecedented (never done before) fifty thousand dollar promotional campaign. The publicity and the Beatles' American tour-opening performance on The Ed Sullivan Show, the most popular entertainment show on television at the time, paid off handsomely. 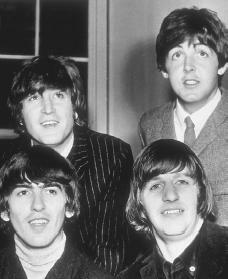 They were given the nicknames "The Fab Four" and "The Mop Tops" (because of their hair styles). The devotion of their fans was called Beatlemania. The Beatles' "I Want to Hold Your Hand," released in the United States in January 1964, hit number one within three weeks. After seven weeks at the top of the charts, it dropped to number two to make room for "She Loves You," which gave way to "Can't Buy Me Love." As many as three new songs a week were released, until, on April 4, 1964, the Beatles held the top five slots on the Billboard (a recording industry publication) list of top sellers. They also had another seven songs in the top one hundred, plus four album positions, including the top two. One week later fourteen of the top one hundred songs were the Beatles'—a feat that had never been matched before, nor has it since. Also in 1964 the Beatles appeared in the first of several innovative full-length feature films. Shot in black-and-white and well-received by critics, A Hard Day's Night was a fictional representation of a day in the life of the group. Critics and fans loved it. Help was released in July 1965. It was a madcap (recklessly foolish) fantasy filmed in color. Exotic locations in Europe and the Bahamas made Help visually more interesting than the first film, but critics were less impressed. The Beatles' 1965 and 1966 albums Rubber Soul and Revolver marked a turning point in the band's recording history. The most original of their collections to date, both combined Eastern, country-western, soul, and classical motifs with trend-setting covers, breaking any mold that seemed to define "rock and roll." In both albums balladry (songs that tell stories), classical instrumentation, and new structure resulted in brilliant new concepts. Songs such as "Tomorrow Never Knows," "Eleanor Rigby," and the lyrical "Norwegian Wood" made use of sophisticated (subtle and complex) recording techniques. This was the beginning of the end for the group's touring, since live performances of such songs were technically impossible at the time. The Beatles became further distanced from their fans, when, in an interview with a London Evening Standard writer, Lennon said, "We're more popular than Jesus Christ now." Later Lennon said he was misunderstood. Some American teenagers took Lennon's words literally, however. They burned Beatles' albums, and the group finished their last U.S. tour amid riots and death threats. Acclaimed by critics, with advance sales of more than one million, the Beatles' Sgt. Pepper's Lonely Hearts Club Band (1967) was perhaps the high point of their recording career. It was not simply a "collection" of Lennon-McCartney and Harrison originals. Presented in a stunning and evocative album package, it was thematically (everything related to one idea) whole and artistically pleasing. Most critics believe it will remain timeless. It contains imaginative melodies and songs about many life experiences, philosophy, and unusual imagery. The Beatles' music had evolved from catchy love songs to profound ballads and social commentary. Trying new things seemed to be an essential part of the Beatles' lives. Influenced greatly by Harrison's interest in India, the Beatles visited the Maharishi Mahesh Yogi in India. The Beatles' next cooperative project was the scripting and directing of another film, Magical Mystery Tour (1967) for the British Broadcasting Company (BBC). It was an unrehearsed, unorganized failure. Intended to be fresh, it drew criticism as a compilation of adolescent humor, gag bits, and undisciplined boredom. The accompanying album, however, featured polished studio numbers such as McCartney's "Fool on the Hill" and Lennon's "I Am the Walrus," as well as "Penny Lane," "Hello Goodbye," and "Strawberry Fields Forever," which were not included in the film. Growing differences between artistic approaches pointed to the Beatles breaking up. In 1968 they recorded a two-record set, simply called The Beatles. It was the first album released by the group's new record company, Apple. The White Album, as it was commonly known, had a variety of songs that had no connection to each other and, some felt, that were often difficult to understand. There particularly appeared to be a growing break between Lennon and McCartney. McCartney contributed ballads like "Blackbird," while Lennon gave antiwar statements like "Revolution" and made fun of the Maharishi. Harrison, on the other hand, shone in "While My Guitar Gently Weeps," aided by Eric Clapton's tasteful guitar solo. For the first time Starr was allotted the space for an original, the country-western "Don't Pass Me By," which became a number-one hit in Scandinavia (northern Europe), where it was released as a single. The Beatles' animated feature film Yellow Submarine was released in July 1968. A fantasy about the Beatles battling against the Blue Meanies, the film was visually pleasing, but did not make much money when it was first released. The remainder of 1968 and 1969 saw the individual Beatles continuing to work apart. Starr appeared in the film The Magic Christian. Lennon performed live outside the Beatles in a group called the Plastic Ono Band with his wife Yoko Ono (1933–). The Beatles spent months filming and recording for Let It Be. It was supposed to be a film of how the group worked together. It ended up as a film showing the group falling apart. Editing would have made release before 1970 impossible, so the project was put on hold. Instead, for the final time, the Beatles gathered to produce an album "the way we used to do it," as McCartney was quoted in Philip Norman's book, Shout! The result was as stunning as Sgt. Pepper had been. All their problems seemed to vanish on the album Abbey Road (1969). The Beatles were at their best. The album contained such classics as "Come Together," "Golden Slumbers," "Octopus's Garden," and Harrison's "Here Comes the Sun" and "Some-thing," which Lennon hailed the best track on the album. They won yet another Grammy Award. American producer Phil Spector (1940–) took over the Beatles' Let It Be project in 1970. The resulting film and album, released in 1971, got mixed reviews. Band members were seen quarreling and unresponsive to McCartney's attempts to raise morale (spirit). By the end of 1970 all four Beatles had recorded solo albums. In 1971 McCartney sued to legally end the group. Throughout the 1970s promoters attempted to reunite them without success. Mark David Chapman murdered John Lennon on December 8, 1980, in New York City, New York. In the mid-1990s, however, new music was released under the original band name. The remaining Beatles played over songs Lennon had left on tape. The singles "Free as a Bird" and "Real Love" were released as parts of anthologies featuring material from earlier Beatles recording sessions. George Harrison died on November 29, 2001, in Los Angeles, California, of brain cancer. Both Paul McCartney and Ringo Starr continue to record. The Beatles were a major influence not only in rock and roll but also in the creation of modern popular music. The Beatles were inducted into the Rock and Roll Hall of Fame in 1988. Lennon and McCartney have also been inducted as solo performers. The Beatles Anthology. San Francisco: Chronicle Books, 2000. Davies, Hunter. The Beatles. 2nd rev. ed. New York: W. W. Norton, 1996. Hertsgaard, Mark. A Day in the Life. New York, NY: Delacorte Press, 1995. Knight, Judson. Abbey Road to Zapple Records: A Beatles Encyclopedia. Dallas: Taylor, 1999. Turner, Steve. A Hard Day's Write: The Stories Behind Every Beatles Song. New York: HarperPerennial, 1999. Venezia, Mike. The Beatles. New York: Children's Press, 1997.